There is quite a bit of disagreement about who invented the first automobile. Some claim that it was in 1768, when Nicolas-Joseph Cugnot built the first steam-powered automobile that was capable of transporting people. Some say it was in 1807, when Francois Isaac de Rivaz designed the first car that was powered by an internal combustion engine. Still others assert that it happened in 1886, when the first gasoline-powered vehicle was invented by Karl Benz. What is generally agreed upon, however, is that the first car accident in the United States occurred in 1891 in Ohio. This was only the first of many accidents that would happen early in the history of the automobile. For a period of time, the roads were a free-for-all – there were no stop signs, traffic lights, lane lines, or posted speed limits. As more cars led to more accidents, those accidents led to a need for what we now know as car insurance. The first official car insurance policy was written in the late 1890s, but the concept of insurance has been around for thousands of years. The first written record of insurance can be traced to the Babylonian kingdom, circa 2000 B.C. There you can find the concept of "bottomy." The contract of "bottomy" allowed lenders to advance the full cost of cargo to ship-owning merchants. If the voyage was successful, the owner paid the lender interest, which included a premium to account for the risk of loss. If the ship was lost, the lender simply forgave the loan. This allowed merchants to engage in maritime trade without the risk of financial ruin. Furthermore, Greek, Indian, and Phoenician traders employed something called the "General Average." A document written in 700 B.C. explains this concept: "That which has been destroyed of all shall be replaced by the contributions of all." In other words, if cargo is damaged or lost, everyone involved in the trade was responsible for absorbing the loss. Understandably, the insurance industry in the United States got off to a later start. 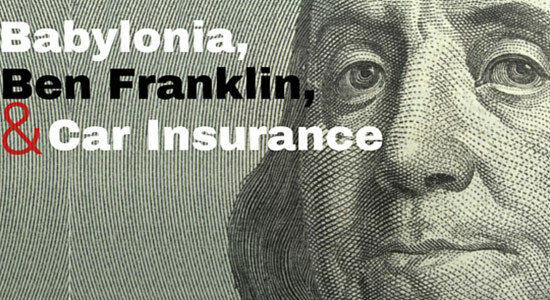 In 1752, Benjamin Franklin organized the Philadelphia Contributionship for the Insurance of Houses from Loss by Fire (also known simply as "Philadelphia Contributionship"). It became the first company in the country to offer fire insurance for property owners. Benjamin Franklin cofounded the first volunteer fire department in Philadelphia in 1736 and saw the devastation that fires could cause. He and his fellow firefighters modeled their insurance company after the Amicable Contributionship of London, in which policyholders come together to share risks. Though the city of Philadelphia was planned with fire safety measures in mind, the risk of fire was still great enough that within a few months of the Contributionship's formation, the directors were issuing seven-year term policies to the citizens of Philadelphia. As society advanced, other things became insurable, and one of the most important of these was the car. Ohio was the center of automobile development in the late 19th and early 20th centuries. As we already mentioned, the first car accident occurred there in 1891, so it's fitting that the first car insurance policy was issued in the Buckeye State. In 1897, Gilbert Loomis bought an insurance policy from Travelers Insurance Company to cover his automobile, though it was technically written as a horse and carriage policy. It protected Loomis in case he hurt someone in an accident or damaged their property. This caused a domino effect. One year later, Travelers decided begin writing policies specific to cars. The first of these was purchased by Dr. Truman Martin in New York. In 1902, a fire and theft policy was purchased for an automobile; it was the first non-liability policy created for a car. Soon after that, multi-line car insurance policies were written that are similar to today's collision and comprehensive coverages. In the early part of the 20th century, car insurance was still in its infancy, and a large number of people didn't have coverage. This meant that even if fault was accurately determined, there was no guarantee that the at-fault driver would be able to pay for any damages or injuries. The state governments eventually stepped in, and in 1925, Connecticut became the first state to implement a financial responsibility law. Car owners had to prove that they could pay for the expenses they caused to others in the event of an accident. However, this proof wasn't required until after a driver's first car accident. Massachusetts also adopted financial responsibility laws, but they required proof of responsibility at the time a person registered their car. This is called "compulsory insurance law" and is what most states have today. Car insurance requirements vary from state to state, though almost all of them require some level of car insurance. If you drive a car, we recommend learning not only your state requirements, but also researching what will give you the best coverage (because they aren't always the same thing). If you live in Pennsylvania, we've done the research for you. You can check out our website for our Pennsylvania car insurance recommendations in addition to talking to your agent about your options. If you're injured in a car accident, you may assume that all you have to do is file a claim and your expenses (medical costs, lost wages, property damage, etc.) will be covered. We've seen time and time again that things don't always work out that way. Insurance companies provide a needed service, but they're also businesses that have bottom lines they want to protect. This can put car accidents victims at a disadvantage. Our advice is simple: Don't say anything and don't sign anything without speaking to an attorney. An experienced lawyer can deal with the insurance agency so you can focus on getting better. “A History of Automobile Insurance.” Random History. January 21, 2008. Company History. Contributionship.com. February 24, 2016. “History of the Automobile.” Wikipedia. February 23, 2016. “The History of Car Insurance.” DMV.org. February 1, 2015. “The Surprisingly Fascinating History of (U.S.) Car Insurance.” Esurance Blog. April 19, 2010.